Written by Madeleine Bair, curator of WITNESS’ Human Rights Channel . This post originally appeared on the WITNESS blog . Five weeks ago, reports emerged from the highlands of Guatemala documenting indigenous communities under attack by the national police force. Testimony of men beaten and dragged away in front of their families, along with images of homes burning to the ground, are reminiscent of stories from the Guatemalan genocide thirty years ago, when the army used violence against entire Mayan communities. While details are unclear due to grave dangers faced by activists and independent journalists  working in the region, online reports from community media outlets paint a picture of a deadly three-day police raid of indigenous villages. Correspondents from Prensa Comunitaria Km. 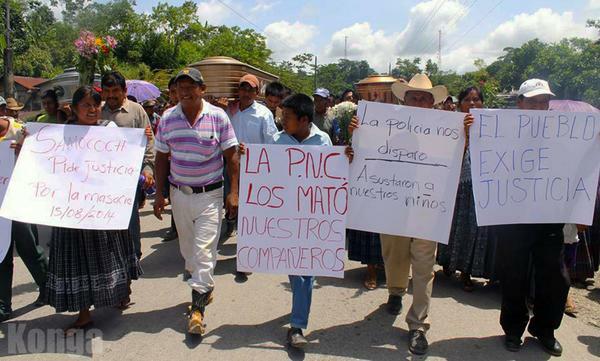 169  and other community media groups documented the events, which began on August 14 and took place in several communities along the Rio Dolores river in the Alta Verapaz region of Guatemala. For years, the predominantly Q’eqchí Mayan communities have resisted the proposed Santa Rita hydroelectric dam , which they say has gone forth without their consultation and would destroy natural resources and their territory. The video above, titled “Eviction in Rio Dolores,” is described as showing the community of Monte Olivo on August 14. It captures a standoff on a dirt road between throngs of Guatemalan police officers and children from the community protesting against the eviction. Monte Olivo is known as the center of resistance to the hydroelectric dam. Last year, two children were shot and killed  there by suspected contractors of the company behind the project. This raw footage is described as showing the community of Semococh the following day. From a vantage point above the streets, it shows dozens of police vehicles blocking a road, and men throwing rocks at them. As the vehicles drive away, tear gas canisters go off, and then officers return suddenly on foot, running in riot gear into the village. The sound of gunfire can be heard throughout the video. A report published on August 15  by Prensa Comunitaria details the raid that took place that day, including the killing of two Q’ecqhí villagers (a third later died of injuries), the arbitrary detention of five people, and more than 60 injuries. The following day, Prensa Comunitaria published photographs  of police officers standing by as structures burn down, and a fleet of police vehicles driving along a dirt road for as far as the eye can see. According to the article, the homes of 50 Q’eqchí families were destroyed within hours. The outlet reported  that several other nearby communities experienced similar raids by a large contingent of the national police force from August 14 through 16. The police spokesperson told the press  that the three deaths resulted from confrontations between indigenous communities against and those in favor of the hydroelectric project. The August 15 report by Prensa Comunitaria noted that the two journalists who had been covering the story for the outlet (and who produced the video testimony above, Rony Morales and Alfredo Rax), were notified that the police were looking for them. The Centro de Medios Independientes-Guatemala also denounced  direct threats that its reporter covering the story had received. Last week, the Committee to Protect Journalists released a new report about threats against journalists in Central America . For more videos of the recent campaign of repression against the indigenous communities of Alta Verapaz, Guatemala, see this Human Rights Channel YouTube playlist . For more testimony of the raids, this Prensa Comunitaria report  from August 23 includes stories from eyewitnesses, survivors, and family members who have since visited detainees in prison. Stay up to date on the latest videos of human rights abuse by citizens and activists around the world, follow @ythumanrights  on Twitter and subscribe to the Human Rights Channel  on YouTube. Featured image courtesy of @PrensaComunitar via Twitter .